The following screenshots explain how a pallet is calculated originally with cylinders but then a master carton is created to simulate the protection that is needed for the cylinders on the pallet. Here are some screenshots from the example mentioned in the previous post. Through this link you will find another example of how to fill a container with pallets containing boxes with primary packages within them. Answer: Whoa, whoa... How many items did you say you have per carton? A: Sorry for interrupting you but can you please go back and see if that case count of 34 can be changed to another value such as 32 or 36? You see, 34 can only be divided by 1; 2 and 17, which leaves us to create boxes that contain items in 2 rows of 17. Unless what you are packaging is really flat, you will create a very long and non-sturdy box. On the other hand, if you use 32, which is divisible by 1;2;4 and 8, you will obtain much better results. The case count of 36 is even better since it is divisible by 1;2;3;4;6 and 8. The resulting box configurations will be more flexible and allow squarer master cartons. 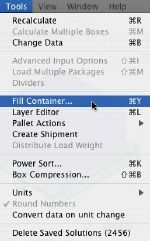 Although this blog is mostly for Quick Pallet Maker support, it's important that we show an example of packaging optimization. In this case, it's California wine in a box from Killer Juice Vineyards. The rectangular box packaging reduces shipping costs (among other material-related environmental benefits) because the box dimensions can be optimized for fitting into a master carton and then into a pallet. Since you are packaging a liquid, you only have a volume constraint and minor requirements for artwork. Besides that, you can assign the size you want to create an optimally-packed pallet. On the other hand, shipping glass bottles wastes plenty of energy and space by moving heavy glass, the internal padding and the air between the bottle necks. Nowadays, with such high energy costs, all savings are valid. Disclaimer: Koona, LLC is not related in any way with the wine makers mentioned above. Question: The Quick Pallet Maker software is in metric units. Is there a way to change to Imperial (English) units and keep it that way. Answer: Yes. To change the default units, first open the Preferences window by choosing "Tools -> Settings" (Windows OS) or "Preferences" from the Apple menu (Mac OSX). Then, once the window has opened, you click on the third option which is to use inches and lbs. Finally, you click on "OK" to save the new preferences. The next time you open a window from the File menu such as the Container Fill window, you will see that the default units are inches/lbs. Through the following link you will find a complete example of how to start from a fixed box, fill it with wooden panels (i.e. rectangular objects), create and save the resulting boxes, use them for filling pallets and finally placing the pallets into shipping containers. Here are some screenshots from an example of how to fill a standard case with wood panels and then pack these cartons onto pallets and then containers (i.e. four levels of packaging). Below you will find a set of screenshots from an example of a container fill calculation.